PELÍCULA-PELIKULA, the Spanish Film Festival, will be featuring the best of contemporary Spanish cinema at the Greenbelt 3 cinemas from October 5 to 16, 2016. Presented by Instituto Cervantes, the Embassy of Spain, and the Film Development Council of the Philippines (FDCP), the 2016 edition of the Spanish Film Festival will screen more than 20 films. Since its conception in 2002 by Instituto Cervantes, the Spanish Film Festival has been an annual attraction at the Ayala Malls Cinemas at Greenbelt 3, bringing the best of Spanish and Latin American cinema to the local audience of Manila. 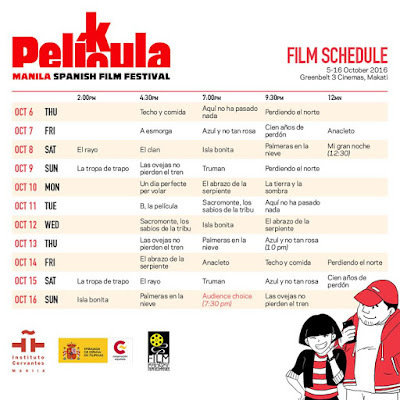 PELÍCULA-PELIKULA is a combination of the Spanish word “película,” which means film, and its Tagalog derivation “pelikula,” echoing the cultural ties shared by Spain and the Philippines. 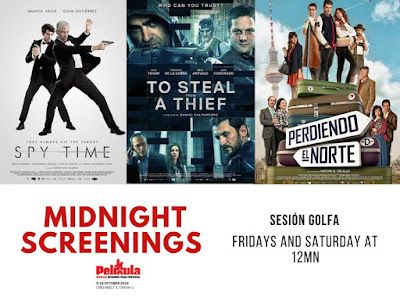 By putting the two words together, it highlights the unique characteristics of this 2-week event as the biggest Spanish film festival in Asia. The Festival will kick off on October 5, with the screening of Truman, a bitter comedy directed by Spanish film director Cesc Gay, which garnered several awards both in Spain and abroad. PELíCULA is not just a caucus for Spanish cinema, but also offers a look into Latin American cinema and the voices emerging from a continent that mainly expresses itself in Spanish. This year’s edition features films from Argentina, Chile, Colombia and Venezuela. Among the films that make up the Latin American program is the delightful Venezuelan comedy Azul y no tan rosa, directed by Miguel Ferrari in 2012; as well as the Chilean drama of Alejandro Fernández, Aquí no ha pasado nada (Much Ado about Nothing) of 2016. From Argentina, a nation with a dynamic and valuable cinematic tradition comes a multi-awarded drama entitled El clan (2015) by Pablo Trapero. In collaboration with the Embassy of Colombia, this year’s festival will feature La Noche del Cine Colombiano for the first time in its history. The Colombian Night puts on the spotlight for two of its best films. This will take place on October 10 and will commence at 7 pm at the Greenbelt 3 cinema 1 with the screening of the adventure film entitled El abrazo de la serpiente (Embrace of the Serpent), directed by the Columbian Ciro Guerra in 2015 and winner of the Filmmakers Fortnight Art Cinema Award at the last Cannes Film Festival. It is also Columbia’s entry for the Best Foreign Language Film for the Oscars. After the screening of El abrazo de la serpiente, La Noche del Cine Colombiano will continue on at 9:30 pm with La tierra y la sombra (Land and Shade), a drama by director César Acevedo. Aside from those mentioned movies, the line-up of films shows a list of genres ranging from romance (Palmeras en la noche, Isla bonita) and comedy (Perdiendo el norte, Mi gran noche, Las ovejas no pierden el tren) to documentary (Sacromonte, El rayo), suspense (Cien años de perdón) and drama (Techo y comida). 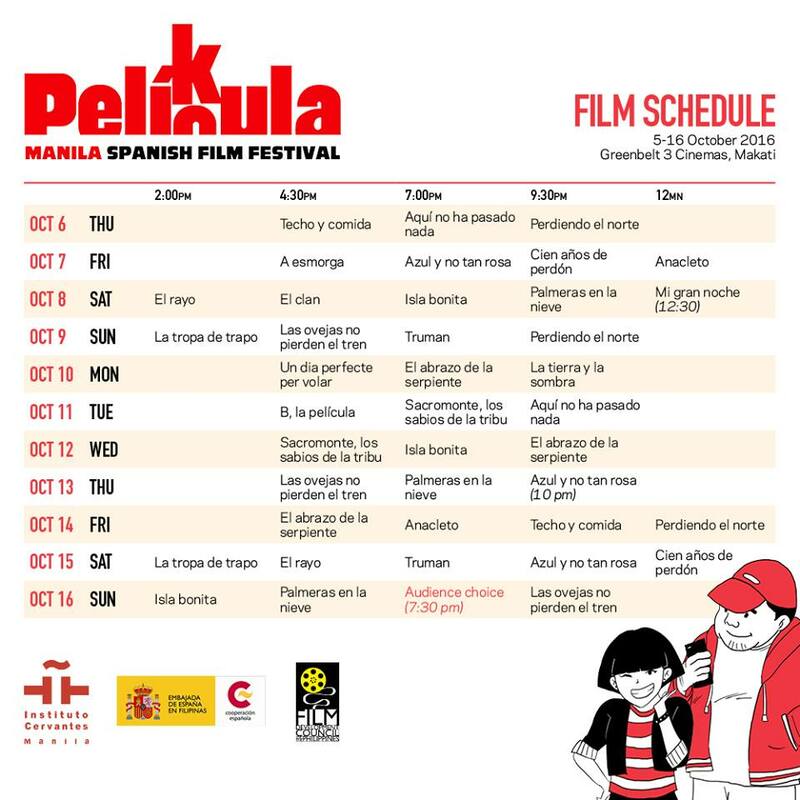 Now on its 15th edition, PELÍCULA-PELIKULA has tried from its beginnings to establish bridges between the film scenes of the Philippines and the Spanish-speaking countries. In this sense, “Encuentros en el cine: Short Films from the Philippines, Mexico and Spain,” scheduled for October 22 at the FDCP Cinematheque Manila, will be a venue to show and discuss some recent short films from the three countries. Thanks also to the collaboration of the Film Development Council of the Philippines (FDCP), a selection of films shown in the Manila leg of the Festival will travel to other cities in the Philippines, namely Baguio, Ilo-ilo, and Davao. 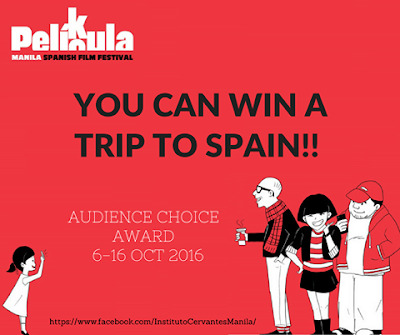 In addition, one should not miss the “Audience Choice” Award that happens in every edition of PELÍCULA-PELIKULA. During the Festival, the audience will be given stubs with which they can rate the movies they have seen. For every five movies, members of the audience qualify to join the raffle where they get a chance to win a round-trip ticket to Spain and other exciting prizes. Presented by Instituto Cervantes, the Embassy of Spain, the Film Development Council of the Philippines (FDCP), and PELÍCULA is made possible by Ayala Malls Cinemas, San Miguel Corporation, Vibal Foundation, Turkish Airlines, Ministerio de Educación y Cultura de España, Spanish Agency for Cooperation (AECID), in collaboration with ICAA, the Embassy of Colombia, the Spanish Chamber of Commerce, Ayala Museum, Buzz Productions, Rustan’s and the Embassy of Mexico. For the schedule, line-up of films and further information on the Festival, please visit the official website of Instituto Cervantes (www.manila.cervantes.es) or log on to their Facebook page: www.facebook.com/InstitutoCervantesManila. Tickets can be booked and bought in advance at www.sureseats.com.